Mary Daniels works on her painting at Artbeat Studio in Winnipeg Manitoba, March 23, 2017. Lyle Stafford/For Metro. Having helped hundreds coping with mental illness in the past 12 years, the non-profit art program is in jeopardy due to lack of funds. For hundreds of adults living with mental health issues, Artbeat Studio has provided an outlet to socialize and heal for the past 12 years. Now the non-profit’s art programs are in jeopardy as the organization faces a major funding shortfall amid growing demand for services, said executive director Lucille Bart. “As we grow and with less funding, it got us into a tight spot right now,” she said. Artbeat launched an emergency crowd-funding campaign to raise $150,000 — money the organization lost after previous federal grants fell through and the Downtown Winnipeg BIZ postponed its 2016 CEO Sleepout, which normally gave them funds. The $150,000 would sustain their programming until the end of the year while they look for more grants and donors, Bart said. Over at Artbeat’s Studio Central location on Kennedy Street, it was business as usual among dozens of drop-in clients Thursday. But program facilitator Jillian Bagan stressed she didn’t know where the 30 to 50 clients she sees per day would go, if not for the studio. 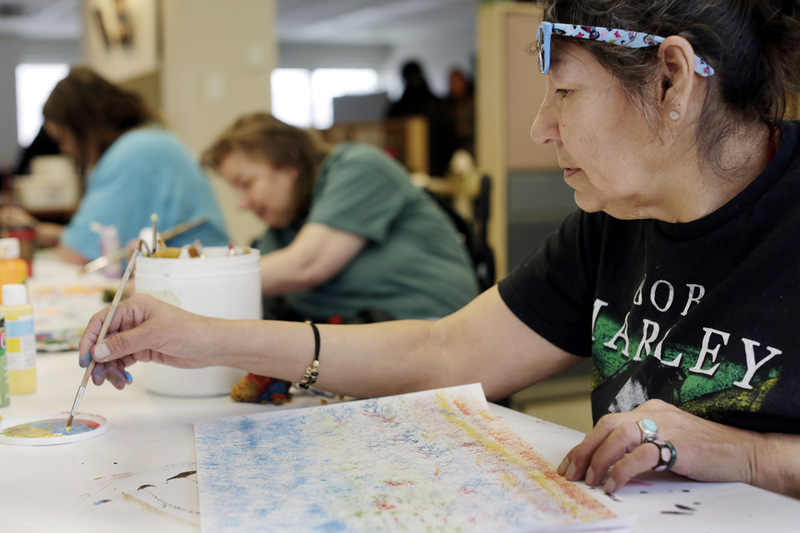 It’s the only avenue of its kind in Winnipeg for adults wanting to do free drop-in art, she said. Brad McKay, who has bipolar disorder and PTSD, led a painting class, while Sandy Rubinfeld wove wall hangings with a wooden loom. Rubinfeld said the weaving helps her focus on one thing at a time, easing her depression and anxiety. For McKay, Artbeat showed him he’s not alone in his mental health struggles. And according to the Canadian Mental Health Association, one in five Canadians will deal with mental illness in their lifetime. On April 28, Artbeat will hold an art auction at the Graffiti Gallery (109 Higgins Ave.) as a cap to their emergency fundraiser. In the meantime, those wanting to buy art or make donations can do so at the Upbeat Artworks store on the second floor of Portage Place.